(SitNews) - Each fall, white-crowned sparrows hop off branches in Alaska and begin journeys toward California, Arizona, New Mexico and west Texas. On their trip of several weeks, flying mostly at night, the tiny songbirds may cut back on their sleep by two-thirds. Scientists in Wisconsin discovered the sparrow’s apparent ability to perform while cutting rest with the help of a few birds captured in Fairbanks a few years ago. White-crowned sparrows are a few inches tall, with a gray body, brown wings and tail, and black and white stripes in the pattern of a bicycle helmet on their heads. Their seven-note song is a sign of spring for many northerners. 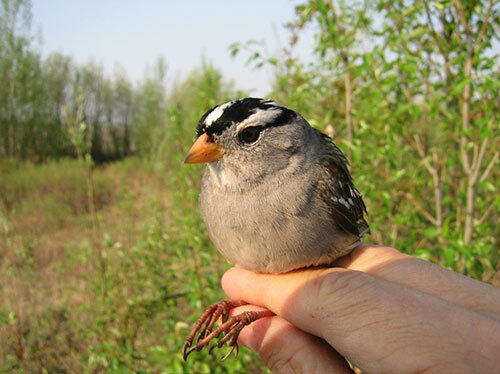 A white crown sparrow that researcher Niels Rattenborg captured in south Fairbanks. Niels Rattenborg of the University of Wisconsin at Madison visited Fairbanks on summer with a mist net and captured 30 white-crowned sparrows near ponds off South Cushman Street and near his hotel on the Chena River. He brought those birds back to Madison, where scientists watched the caged birds. They found that the birds were restless during spring and fall migration, waking up in the middle of the night to hop around and flap their wings. When compared to times when they normally wouldn’t be migrating, the birds slept about 63 percent less during fall migration. One bird that slept about nine hours at night during the non-migrating part of the year cut its sleep to 1.4 hours during migration times. Rattenborg and his colleagues wanted to see if the white-crowned sparrows that were sleeping less during migration were punch-drunk while awake, so they set up a test in which birds learned and repeated a three-response sequence of key pecks. The caged birds performed best on the test during fall migration time, when they were getting the least sleep. Why do living creatures need so much sleep, anyway? It’s a simple question that scientists haven’t answered, though research has shown that just one night without sleeping can make people less alert, more forgetful and less capable of solving problems. Fruit flies and rats deprived of sleep die. “It’s likely that sleep provides for more than one thing,” said Brian Barnes, the director of UAF’s Institute of Arctic Biology who has studied sleep patterns in hibernating black bears. He said people and other animals might use some of an eight-hour sleep period to rejuvenate the brain, memory and learning. Part of a night’s sleep might also help recharge immune function and general health. The white-crowned sparrows that performed well on pecking tests while in the migration mode might be sacrificing something else, Barnes said. When urges to migrate kick in, white-crowned sparrows and other songbirds begin flying perhaps as much as 300 miles at night while staying active during the day. Their ability to navigate, avoid predators and find food in different locations while sleep-deprived is a mystery that may someday “provide insight into the . . . treatment of certain sleep disorders, as well as psychiatric disorders such as bipolar disorder,” Rattenborg and his coworkers wrote.